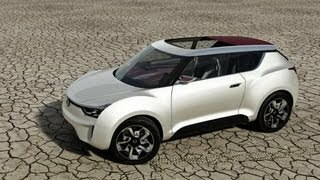 SsangYong is presenting its all-new XIV-2 convertible concept car at the Geneva Auto Show 2012, a successor concept model to the initial XIV-1 concept revealed at the Frankfurt Auto Show 2011. 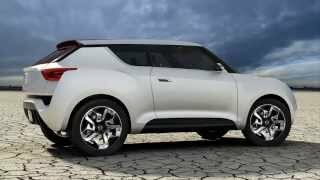 XIV-2 is a study concept to research the potential of the premium crossover utility market; its design showcases a robust and powerful SUV with dynamic style of an open top sports coupe. 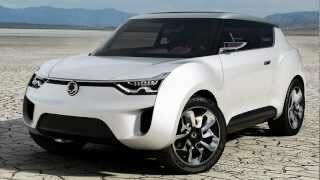 SsangYong Motor Company is gaining a reputation in Europe for creative, futuristic and advanced designs, and at this year’s Geneva Motor Show the 4x4 specialist will unveil its next groundbreaking concept. 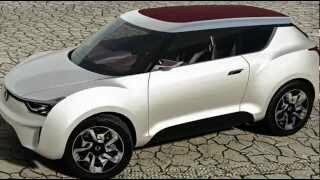 Making its world debut in Geneva, the XIV-2 is a premium convertible CUV (crossover utility vehicle), and follows in the tracks of SsangYong’s XIV-1 show car, first shown at the IAA in Frankfurt, September 2011. Evolving the idea behind the first generation concept, XIV-2 (eXciting User Interface Vehicle 2) has been developed into a vehicle that offers ‘a special experience with fun’. Central to that fun element is an advanced convertible roof to give driver and passengers a rich ‘wind in the hair’ experience whether travelling on or off road. XIV-2 is SsangYong’s strategic global model, and has harnessed every element of the company’s design and engineering expertise from its inception. B segment in size, this CUV retains at its core a dynamic, robust SUV and has been tailored through global design clinics to appeal to young drivers in their twenties. Representing a strategic milestone for SsangYong, XIV-2 will be launched in various body styles including 5 door, 3 door, coupé and an extended body version.